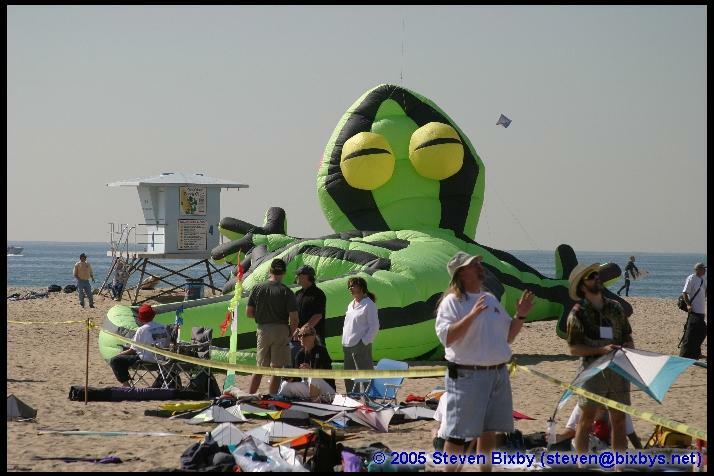 I first ran into Steve Bixby down at Dave Shenkman’s Kite Party II down in Huntington Beach in February 2004. 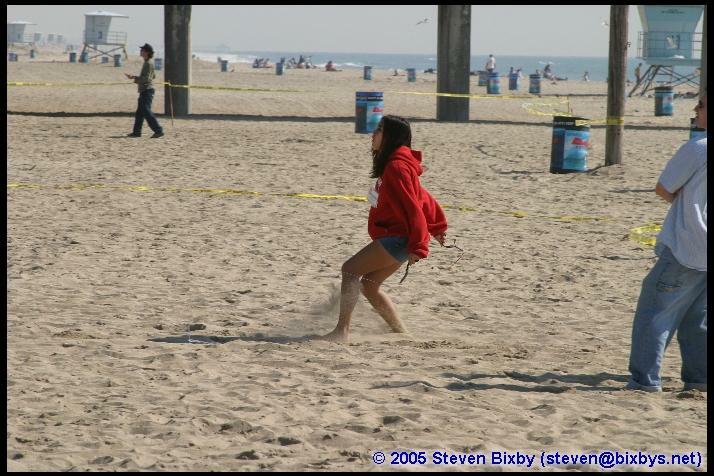 He was busy running around shooting photos, and I was busy being the proverbial kite-bum, mostly yakkin’ with other participants. We’d wave or nod as we passed each other – each headed for who-knows-where, and enjoying ourselves tremendously. Then I caught some of his images on the internet after “The Party,” and was just fascinated with his unique “eye”. 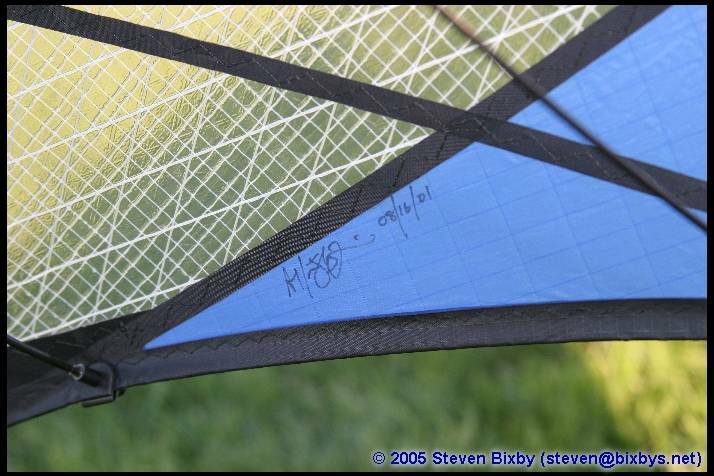 So when we had a chance to go to breakfast together at the Spring GWTW Open House a few months later, I was delighted to talk kite photography with Steve. It turns out that we had a lot in common besides kites and photography, so we enjoyed our time together and I felt I’d made a fascinating new friend. Okay, Steve. 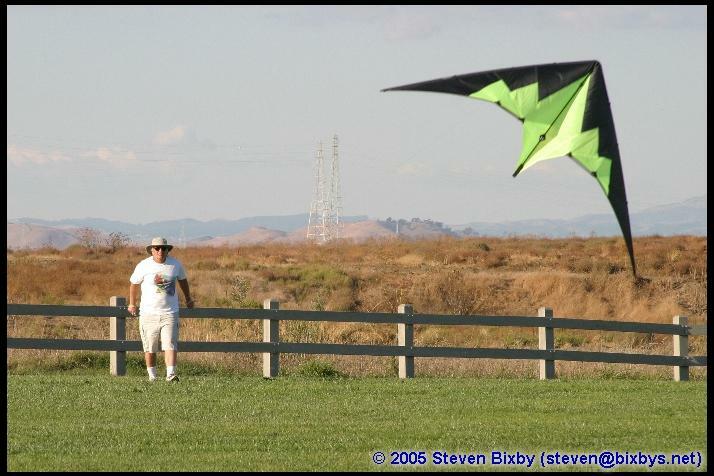 I’ve been interested in your kite photos for a couple of years now. 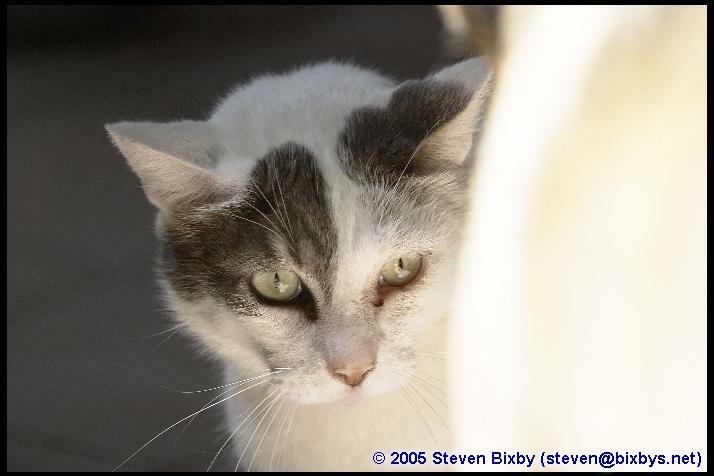 How did you happen to get into photography? It’s hard to say, actually; I never really just told myself “I want to be a photographer”, at least not until more recently. I had the typical complement of inexpensive cameras as a kid, starting with a little ol’ Kodak Brownie “Starflash” model that my father bought for me. Once I started college, my mother was teaching herself photography with a Minolta SLR, and when Christmas came around she went halfsies with me to get the same model and a pair of lenses, and a book on SLR photography. That book was probably the genesis of my interest, detailing the technical side of photography, such as exposure, lighting, composition, etc. So you’ve been using cameras for a while now. 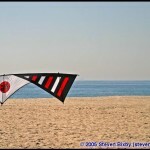 When did you get interested in Kite photography itself, and how did that happen? 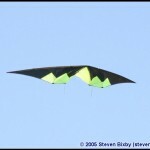 Did anything in particular fuel your interest in “capturing” kites with a camera? In my opinion, kites are a fantastic target for photographic artistry. 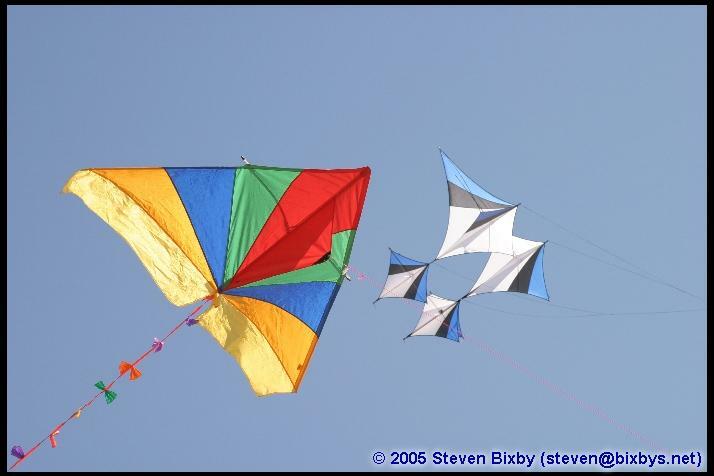 There is such a huge variety of shapes, colors and activity with kites that photographers may never run out of new material to capture. 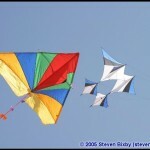 My first efforts with photographing kites probably started at the Berkeley Kite Festival in 2003. My wife had a crafts booth at this event, and I usually go along to help with setup and takedown, and spend the rest of the time wandering around. 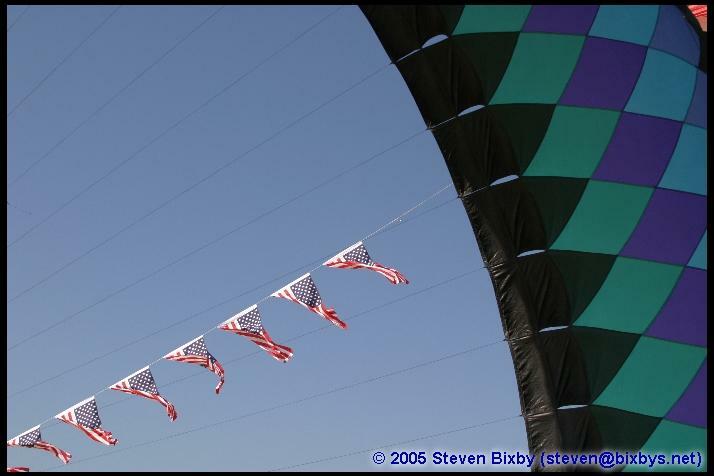 I took a number of shots at this festival, and when I showed some of them to my wife, she insisted that I enter some in a local art show, which I reluctantly did. After her reaction and that of a few show attendees, I realized I had some talent in picking out interesting photo compositions. 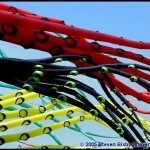 So, did the Photography lead to your interest in Kiting, or is it the other way around? If you had to characterize yourself as a photographer, what would you call yourself? I would say “other way around”. 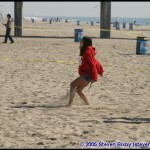 I had some interest in photography, and at the time, a lot more interest in kiting, but separately. 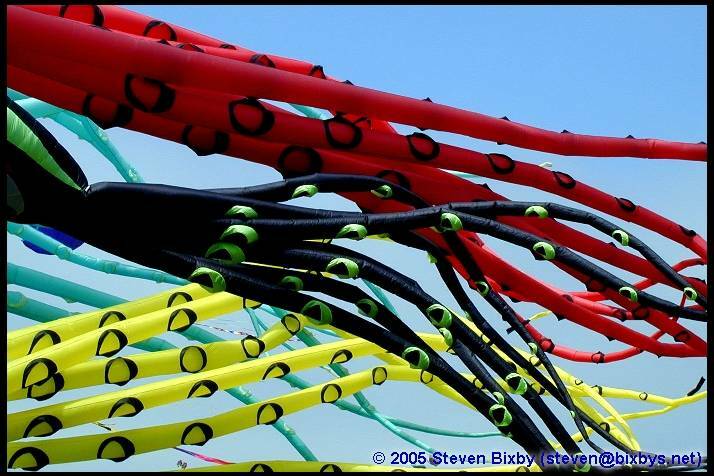 Once I started shooting kites and felt artistically inspired, the two came together nicely. I’d call myself a “burgeoning hack photographer.” I don’t really know how to explain it as such, I just see shapes, colors, and patterns – and want to capture those views. It turns out quite a few people loved some of my photos, so I’m inspired to keep going. 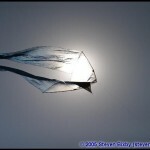 As time goes on, I explore new ideas and techniques, shoot a lot of really bad shots and a few pretty good ones, and finally the proverbial “light in the refrigerator” comes on in my head – this is how that technique makes a fantastic photo! Great! 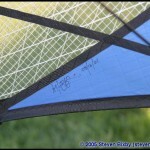 Now give us some insight on your own personal kiting interests… Are you an active dual-line pilot, for instance? 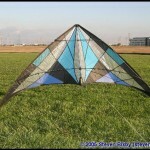 Do you fly quad-liners or the big single-line kites too? 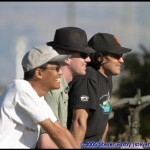 How much of what you do with a camera stems from a desire to document your own kiting lifestyle? 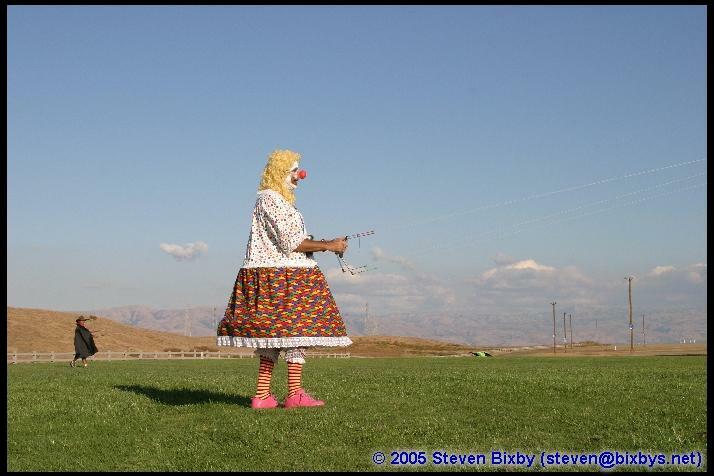 Or do you really see yourself strictly as a kite photographer who also happens to fly a little? 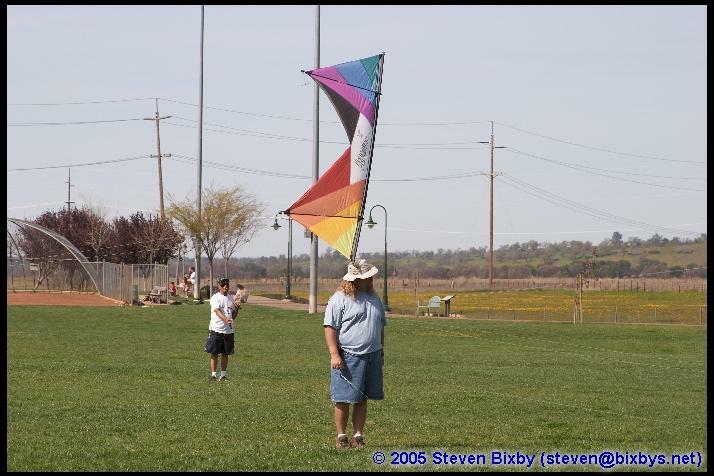 I’m an all-kinds type with kites. I’m mostly exploring freestyle dual-line kites so far, but I have a few smaller SLK’s I like to put up while flying multi-line kites, and I have a couple of Revolution’s and foil kites in the bag.. At the moment I’m biding my time with the quad-line kites while I explore dualies, but I intend to learn to fly quads well too – eventually. 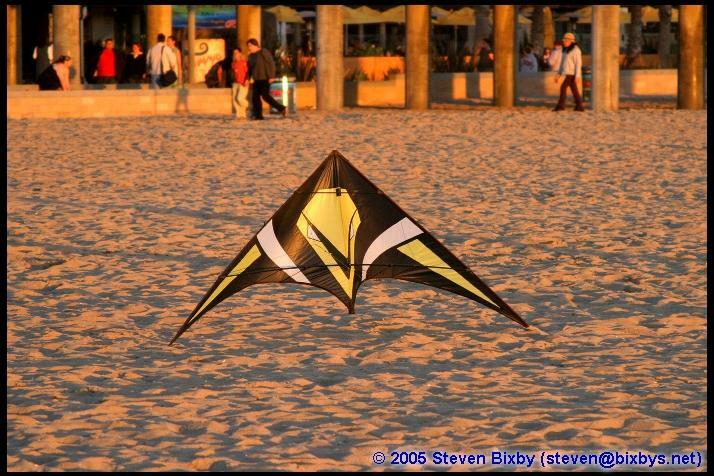 As far as photography and kites in my life, I would say they’re actually separate. 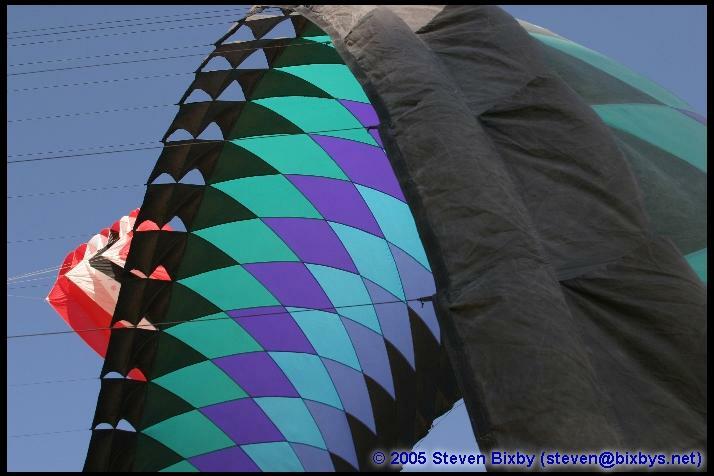 I like many other photographic subjects as well; since I’m active in the kite scene, there are many opportunities. 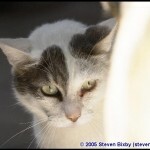 But, if I see something that catches my eye in other activities of my life, I will often photograph it. Interesting… Have you any formal study in Photography or Cinematography? And are you doing any “film” work, or is it all “digital?” If you’re shooting with film, are you doing your own darkroom work? And how much “post-processing” are you doing at the digital end of the game? I haven’t had any formal training. I’m a “manual junkie” – I tend to read user’s manuals and photography books cover-to-cover, so you could consider me self-trained. As I mentioned before I did do some film work, but never tried my hand at developing. 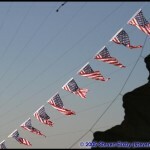 Once I started digital photography, I never looked back! Aside from an underwater disposable camera on vacation, I haven’t shot a roll of film in probably 10 years. 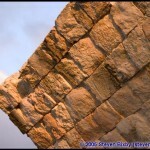 As far as post-processing – I try to go the old-school route of getting the best possible image right from the camera. I do, however, very much like the ability to fix shots that are good but for a bit of a problem, or to compensate for difficult conditions, such as poor lighting. 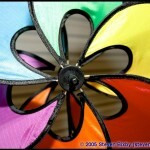 But generally, other than crop, sharpening and maybe some color tweaking, most of my shots are straight from the camera. Well, let’s get to these fascinating images we see in your gallery. Tell me a bit about them… What equipment are you using to shoot, and why? These photos are a collection of favorites from the last two years. 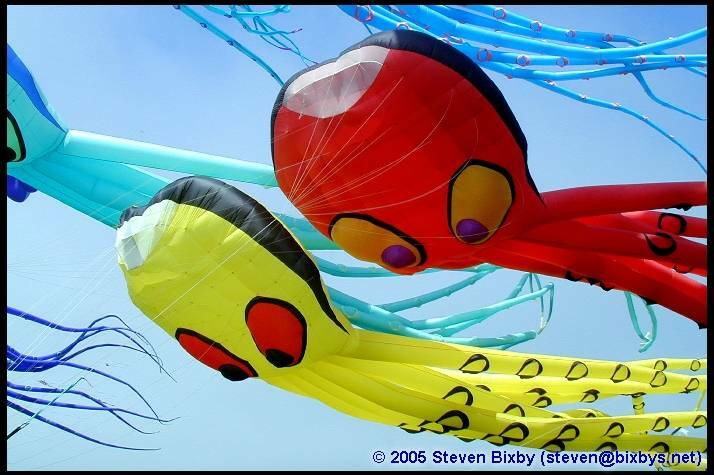 The first four are from the Berkeley Kite Festival; many from BKF, Kite Party II, GWTW Open House and informal kite gatherings at Baylands or Shoreline. 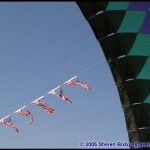 I also included a few of my favorite non-kite photos. Nearly two years ago when digital SLR bodies became affordable, I invested in a Canon 10D camera body and a couple of lenses. Over time I’ve added a couple more lenses – a wide-angle and a long telephoto. After realizing that the consumer level point-and-shoot format had many limitations I disliked, I went with DSLR because it gave me a similar level of control to a 35mm film body. I have full control over all aspects of the camera, such as lens choice, manual aperture and shutter speed, exposure compensation and even “ISO film speed” at my fingertips. 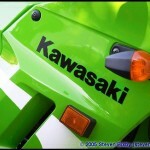 Not to mention a very low focus and shutter-lag times, which helps to get the timing right on action shots. Hmm… as I hinted at before, I’m not sure how to define that yet. I am still expanding my skills and subjects, and not limiting myself to one style. I expect that over time, as my skills increase and my subjects become more varied, I will develop a style that defines me as a photographer. For now, anything is fair game. Okay, Steve. I’m going to take a hard right, here, and start to focus on the “Man.” Where are you from originally? I am from northern Minnesota – I was born in Cloquet, just outside of Duluth. I lived with my family in a couple of other small towns until age 11 when my family moved to Craig, Colorado for my teenage years. From there I went to college in Grand Junction Colorado (Go Mesa State Mavericks!! ), while my parents moved to southwest Denver; I spent my college summers living with them and exploring a big city for the first time in my life. After graduating college, I took a job with Visa in the San Mateo area. For the first 10 years of my life in California, I yearned for the small town atmosphere and family ties of rural Colorado, but over time built a life here that was hard to consider leaving. 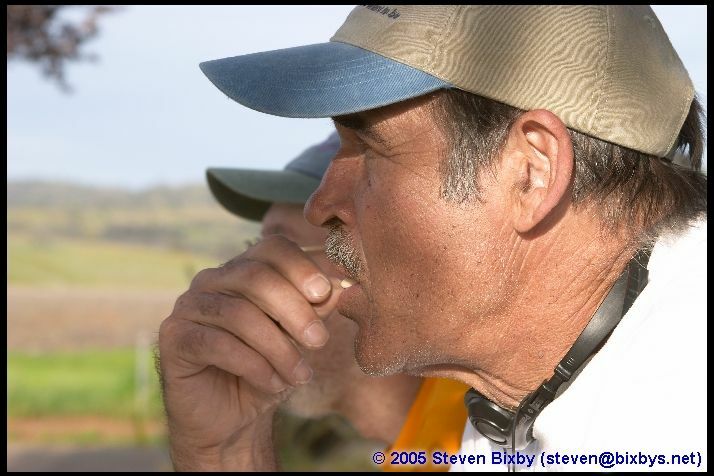 In 1998 I met the love of my life and we married in September 2000 – we settled in El Sobrante, close to the Berzerkely Kite Wrecking Field and several other choice flying spots. 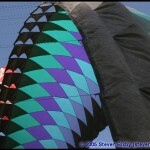 How did you get involved in kiting? What originally attracted you to it? 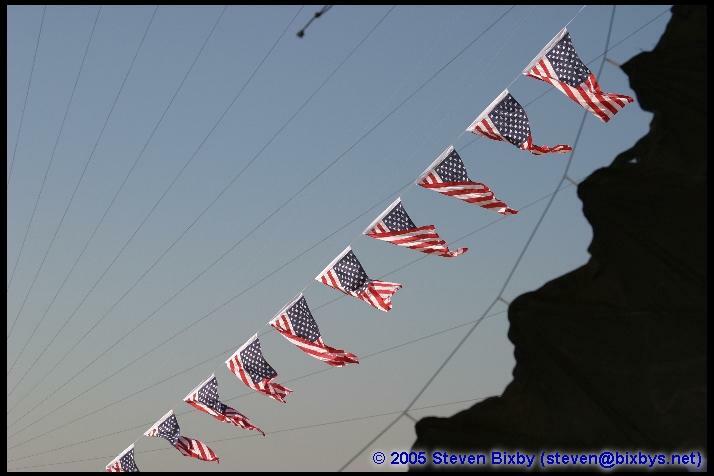 About 8-9 years ago, my uncle visited San Francisco on a business trip, so I hooked up with him and we wandered around the City. 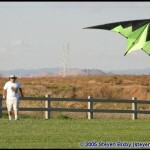 One place we stopped was the Marina Green field where several kites were flying. My uncle was very interested at the time, and we chattered about it for awhile before he went back home. A couple years later, I got the bug for a new hobby with “flying stuff” – I have been a longtime model aviation enthusiast but my planes and equipment were packed away for several years. 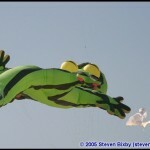 A controllable kite looked like fun, so I found a place on the web and suggested to my wife (then fiancé – “Hi, Wenona!! !”) that it would be a cool birthday present. 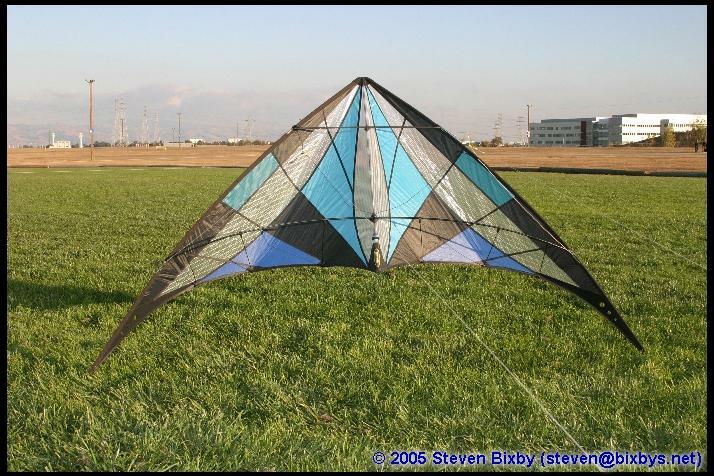 I’d also managed to exchange some emails related to model aviation with the co-founder of Prism Kites, which led to my choice of the Prism Flashback as my first kite. At the time, I didn’t know anything but “fly circles, figure eights and crash landings”, so it became a little boring after awhile. The fellow who led me to the Flashback also offered to send me the Prism videos, and I took him up on his offer. The tricks were astounding! I wanted to do this stuff! The rest is, of course… history. 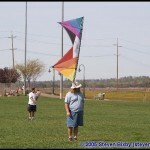 Is there anyone who has been a major influence on you in regard to kiting? 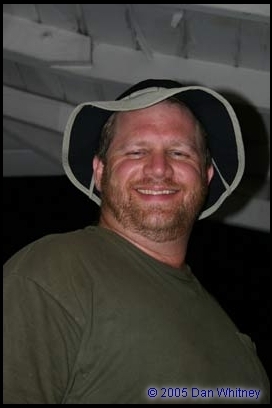 I would have to tip my floppy-brimed hat to “The Baylads” and the Gone With The Wind kite forums. 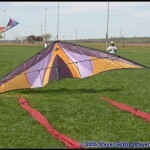 I found the GWTW forum site and began to read it, and realized there was a large community of kite flyers in easy reach. 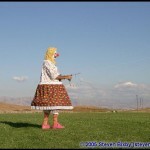 I started to exchange messages on the forums and got help with the basics of slack-line trick flying. 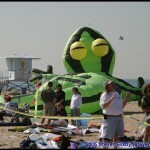 Eventually I talked myself into attending a gathering of San Francisco Bay Area kiters, and introduced myself to them – John Chilese, Brent Jensen, Dan Whitney, Wayne Fu, Francisco Navarro, Allen Carter and many others. 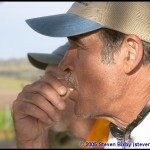 These are the folks that inspired my interest and growing dual-line skills. 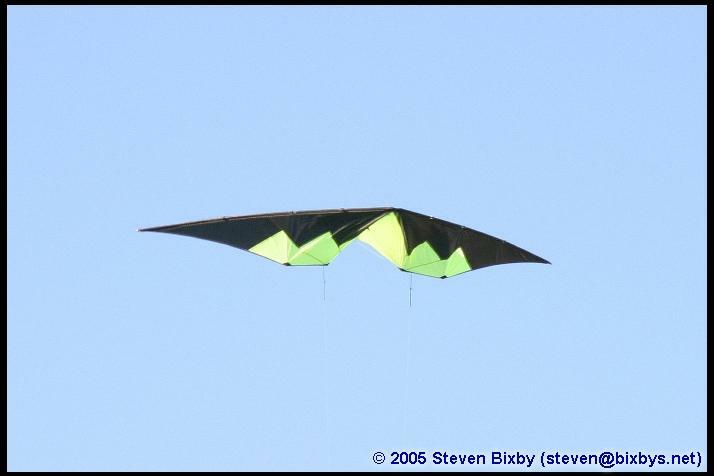 The biggest factor is the challenge of flying dual-line freestyle kites – of exerting control over the kite (rather than vice-versa). I also enjoy being part of the group of friends that seems to be spread around the globe. 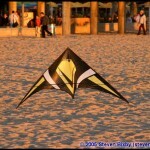 In what ways has kiting affected your life? 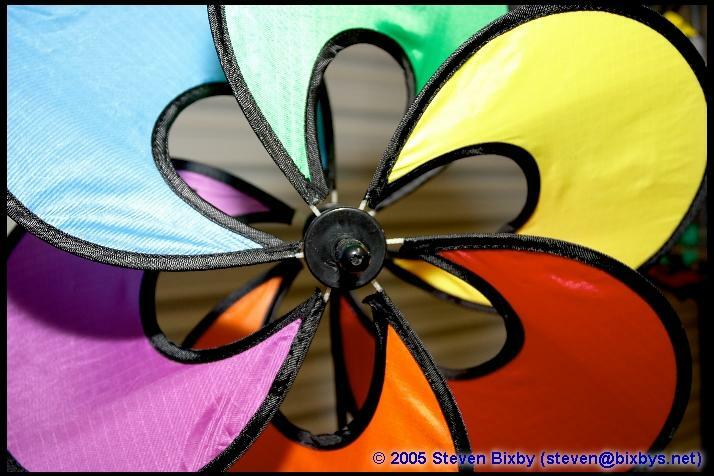 It’s given me a hobby/sport I enjoy, greatly expanded my circle of friends, and last but not least – it has inspired me to explore my artistic side with photography. 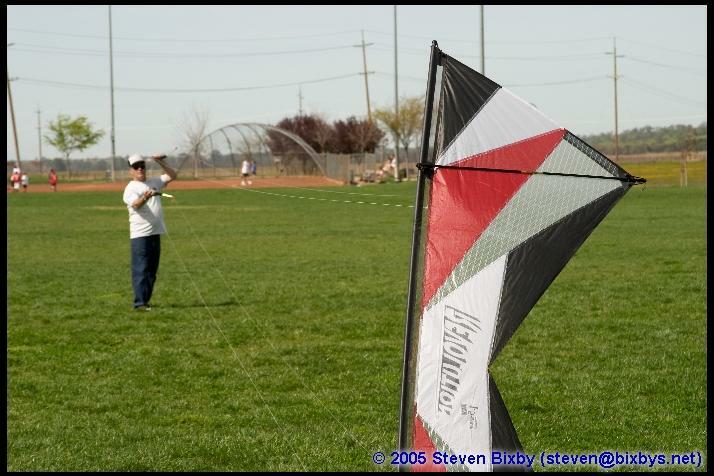 Aside from kiting, what other hobbies/sports/activities are you involved in? Oh, man, sometimes it seems like “just about everything”. So many hobbies & sports, so little time! 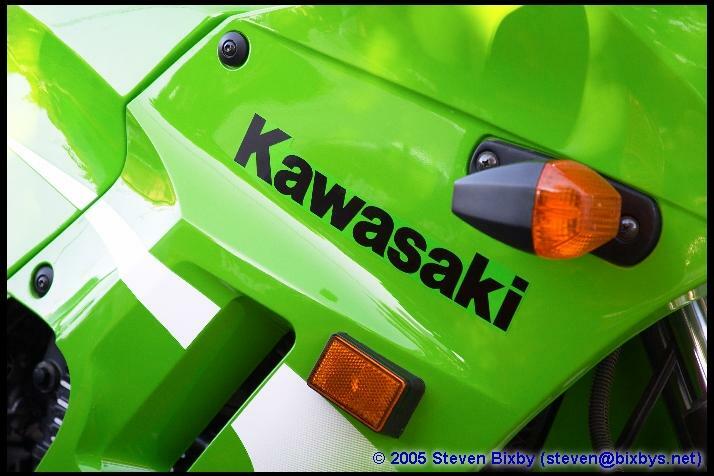 Let’s see… motorcycling, photography, bicycling, model aviation, model rocketry, windsurfing and skiing are some of my past & current activities. I still have hopes of trying scuba diving, soaring (real aircraft), skydiving, and several other death-wish sports. 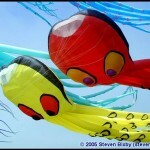 What are some of your favorite kite festivals, and why? That’s easy, considering that I’ve only been to two festivals, so far – the Berkeley Kite Festival and Dave Shenkman’s “Kite Party”. I’d like to go to some of the other events someday; WISKF would be great and it’s not too far off. Perhaps the next AKA convention that comes out this way. Part of the issue is simply not having much vacation time to work with, and when I do, my wife and I like to truly “get away” from things that we can and would do at home. 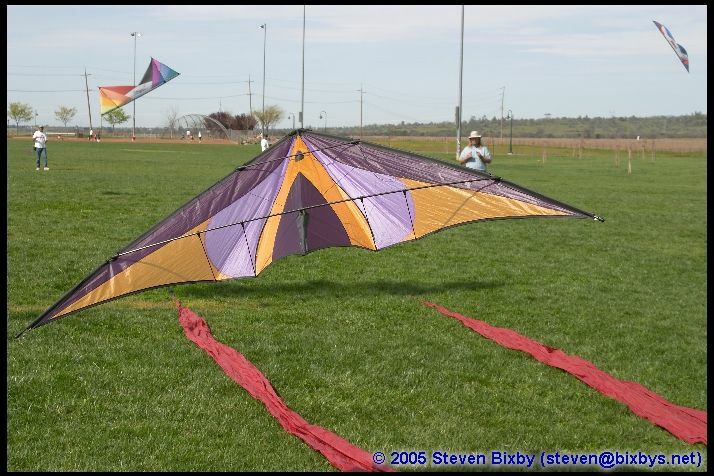 Do you think that the kiting scene will ever become mainstream, and if so how might we go about making it happen? Coming from a background of other hobbies that are not mainstream, I have my doubts. 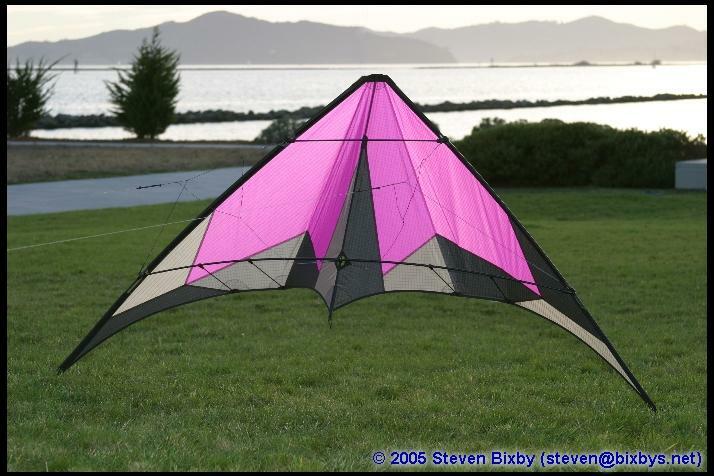 The growth of kite surfing probably does a lot for the kite world, but it too is relatively obscure. Seriously, I personally think it’s OK that kiting is a niche activity; the scene is full of people who really enjoy kites and are true enthusiasts. This unique dynamic might not survive mainstreaming of kiting – or maybe it would grow even stronger, who knows? Thanks, Steve! Could you give us an idea of where you personally want to go with all of this? What would you like to do in the future that you haven’t done? And how do you plan to get there? 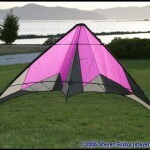 For kiting – I want to keep working on my skills in dual and quad-line kites. I have no real interest in competition, but striving to learn that difficult trick keeps me interested. I just keep going to the field with intent to practice some maneuver that eludes me, but without feeling the do-or-die need to succeed. If I don’t get it this time, then next time maybe I will! 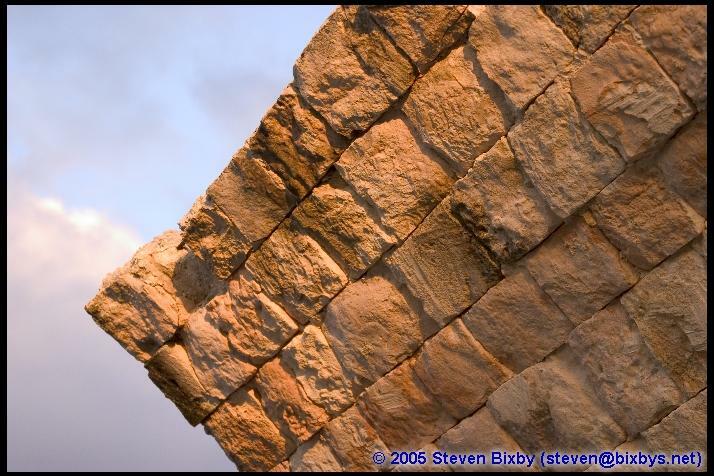 For photography, as I mentioned before, I want to find that special style that appeals most to me and learn everything I can to suit that style. I dream that someday I can make a living at photography – and travel to new and exotic places to capture those elusive “perfect photographs” that only come along once in a long while. To do this, I will need to work harder at perfecting my technical skills while exploring my artistic side. 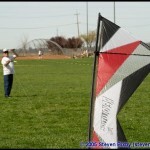 Far from it for me to be the teacher, but my advice to novice kite photographers: Learn your equipment. Take the time to understand what does what and why you want to use it. Experiment with features and settings and how they affect the outcome. Look at other photographs you find appealing and figure out why that photograph captures your interest; look at photographs you dislike and figure out why it bothers you, and how to avoid that in your own photographs. And most of all – look for what tickles your emotions and try to capture the subject such that you feel those emotions even more when you look at your resulting photographs – then you will have an artistic expression that is truly from yourself. Thanks for the advice Steve, and also thanks for an interesting interview and a chance to view your fascinating photography… This was lots of fun! We’re grateful that you took the time to talk with us and share your images with us. And keep us posted, won’t you? Thanks very much to you too, Dave – I’m very flattered with your interest. 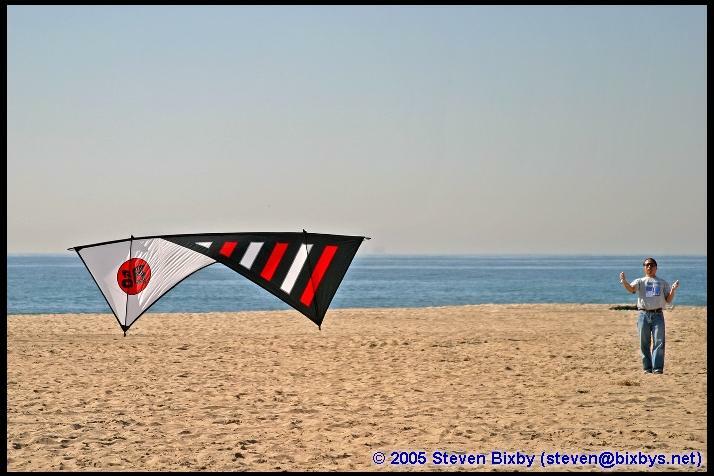 Having seen the interviews of Rob Vreeland and Dan Whitney in recent issues, I’m thrilled to be able to share my own photographs and thoughts, and hope I can do justice following these exemplary ambassadors of the kite photography world. Steve… Besides being a truly nice guy, you have a fairly unique photographic “eye.” While you say you haven’t really developed your style at this point, I’m fascinated by what you see through your viewfinder – your unusual shots, the unique perspectives, and even the whimsy that sneaks in every now and then. Yes, there’s a part of Kitelife that plays to the old, established pros… But there’s also plenty of room here for the up-and-coming authors and photographers, too. 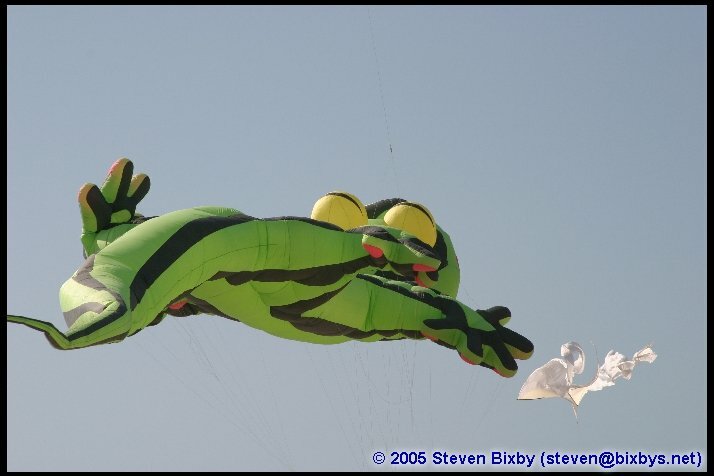 And Kitelife is, and will continue to be, about ALL parts of kiting… You definitely fit in there, Sir – and we’re delighted to have the opportunity to share your unique images with the kite-flying public. This entry was posted in 2005, Issue 42 (May/Jun), KL Archive and tagged interview, people, photography.